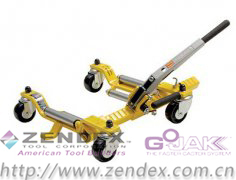 The Model 4520 Super-Slick was developed for the race car industry. You can effortlessly lift and move cars with tires as wide as 20 inches and up to 36 inches tall. The unit will handle wheel weights of 1,125 lbs. (up to 4,500 lbs with four units). 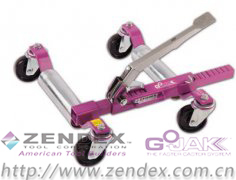 Twin rollers on each axle guide the tire smoothly up and over the axle support bar to lift wider tires. 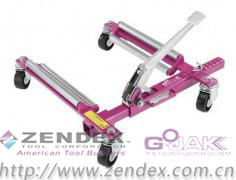 This auto jack / auto dolly unit uses a bi-directional linear ratchet for the jack portion and has a 5-degree offset pedal angle for additional foot-to-tire clearance.